Good clean power. Easily as powerful as my 90 watt Yamaha in stereo. Tight defined Bass No harshness at high levels. Standby power consumption is a little high measured at about 10watts. Great unit considering it is a receiver. Clean, clear sound. Volume increments are a bit broad but it has plenty of power. Able to pick good FM signal. Run it with some good cables and turn off clipping at rear and with tone defeat switched on and you will hear a lot of depth, just as music was recorded. A good no fuss unit which has proved to be very reliable. Integrates well with other remote control NAD devices, cd etc. Remote control is poorly planned, need to move toggle switch to operate CD. Remote volume control really coarse, moves too far up or down each press.. Sounds second rate at low volumes. Marketed as high end product like the early NAD stuff, it sounds ordinary, low grunt. Went to Perth Australia Hifi shop, wanting to upgrade my Yamaha amplifier to a Yamaha or Denon receiver with remote control. Old Yamaha made my Mission speakers sound fantastic, but vol control was getting noisy, and I wanted remote control. Sales guy talked me into NAD, and I was sucked in, mainly on NAD's previous reputation. This receiver is a step backwards. Remote voilume control is too coarse, ie, one press gets too loud or too soft. No loudness setting, ie sounds very flat for low levels. No grunt. Great warm, detailed sound. 50 Watts go a long way. Excellent AM & FM reception. No sleep timer. The switched outlet on the unit does not turn another component on and off in conjunction with the receiver. I have had a couple of middle of the road receivers and was looking to take a step up. 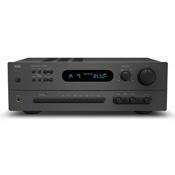 The NAD C720BEE in my opinion, is a big step up from the middle of the road receivers. I think that if I was to take the next step up in sound, I'd be paying a lot of cash. The C720BEE does not get hot, barely even warm to the touch and that is after playing the unit for 4 or 5 hours. Although the receiver is rated at 50 watts, it is as loud as my 80 watt Yamaha stereo receiver. These 50 watts offer a great deal of head room. There are plenty of inputs. The remote is fairly simple and works well. The C720BEE has RDS, which is a nice feature. FM and AM reception is excellent. Tone defeat is also a nice option. The sound is smooth, clean and defined. Vocalists sound, well, real. Strings come out warm and detailed. I would have liked for the unit to have had a sleep timer, but no big deal. The other thing that I would have liked is an outlet that would turn off and on my cd player when the C720BEE is turned on and off. Nad says that the outlet is "switched". It is switched in the sense that the cd player can be turned off with a switch on the back of the unit. It is not switched in the sense that the outlet will turn the unit on and off when the receiver itself is turned on and off. Again, a minor inconvenience. I had to buy a new cd player anyway, so I just made sure that the new player can be turned on and off with a remote. Although the outlet and sleep timer would have been nice, the sound and quality of this unit make it pretty easy to overlook these things. If you like the convenience of a receiver and great sound, this receiver is for you. Highly recommended. Very powerful for 50 watts per channel! Would like to have seen the Bass EQ on this model to use with older recordings. Nakamichi RE-10, Onkyo TX-8511, Nad 7100, Carver Reciever.